Whether you’re looking to keep your own holiday memories alive or for a present for someone back home, Granada has some exquisite places to shop for souvenirs. From the colourful, cluttered alleyways of the Alcaiceria market – formerly the city’s Grand Bazaar – to a shop that sells the finest handmade glassware, these are the places to head for the best souvenirs in Granada. 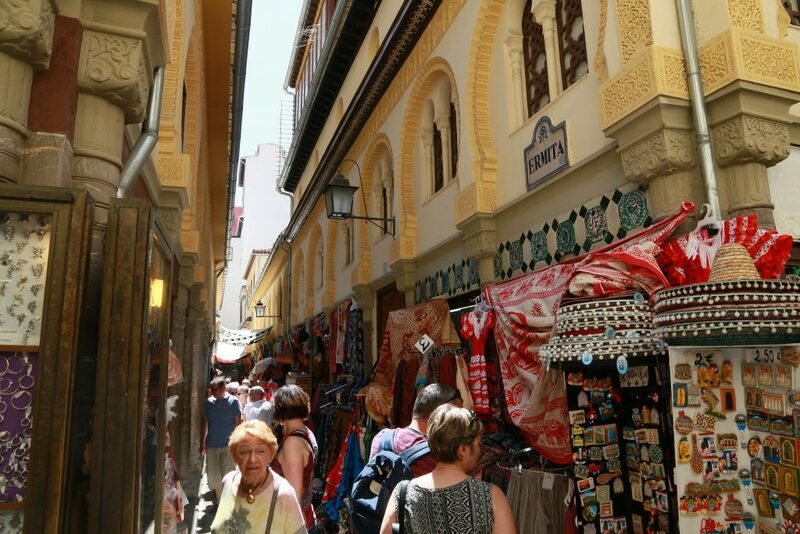 Granada has one of the richest Arabic history’s in Spain, so if you want a gift that reflects this aspect of its legacy head to Calle Calderia Nueva, a mini-souk in the heart of the city. This fascinating little street winds its way up to Albaicín from the central thoroughfare of Calle Elvira and is lined with Arabic textile and ceramics shops selling items that make for perfect presents. 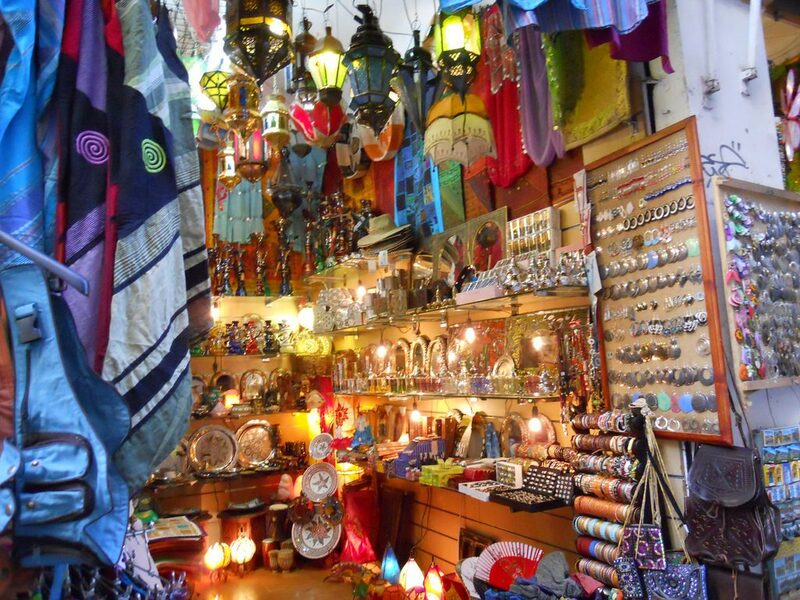 Beautiful handmade rugs and throws, Moorish-style jewellery boxes, leather handbags, ornate chess sets, Arabic lanterns in all colours and sizes – it’s all here and prices are often negotiable, if you fancy practicing your haggling skills in Spanish or Arabic. You can also – if you feel it’s not too cheesy – get your name written in Arabic for a couple of euros. As the name suggests, this lovely little shop in the Realejo neighbourhood of Granada offers a range of handmade artifacts that make for ideal gifts. The window display is always enticing, featuring exquisite wooden ornaments and leather goods with a Moorish flavour, whilst inside fabrics, ceramics and clothing are also available. Although just five minutes from the busy Plaza Nueva, this shop is off the main tourist track and is always fairly quiet, meaning you can select your present in peace and quiet rather than surrounded by noisy groups clamouring over “I Heart Granada” t-shirts. Definitely the place to go if you want to take back a present with a little class. 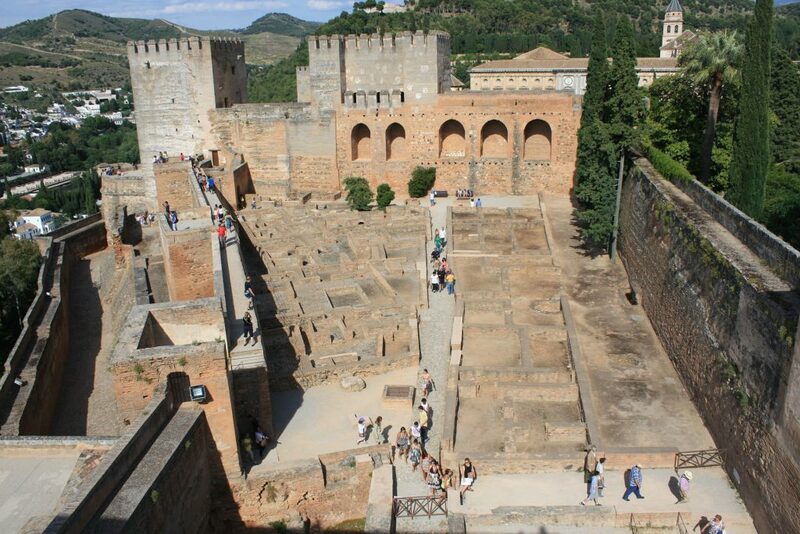 Though the Tienda Librería de la Alhambra might describe itself as a bookshop, it is much more besides. It sells various gift items centred on Granada’s most famous historical monument, the mighty Alhambra fortress that sits on top of the hill above the shop: t-shirts, jewellery, perfume, cologne and ornaments are on offer as well as some fascinating and beautifully-designed books exploring the history of Granada and the Alhambra. This isn’t a particularly cheap store, but it sells quality products that are bound to be well-received back home, to it should be on your list if you’ve souvenir shopping in the city centre. Most of the tourist shops on the central square of Plaza Nueva sell the purest tat, but Caravansar – situated directly opposite the Alhambra bookstore – is a little bit different. An art gallery that displays the work of local artists, it sells some beautiful paintings and sketches of Granada’s prettiest streets and squares, as well as numerous renderings of the Alhambra fortress. These obviously require a little more outlay than the tacky “flamenco” fans and toy bulls on offer in the surrounding shops, but you’ll be getting an original piece of art that will make for a very special gift for friends or family back home. If you’re buying for an art lover or perhaps for someone who loves Granada themselves, then this is the place to head. Now confined to a few narrow alleyways between the cathedral and Plaza Bib-Rambla, the Alcaiceria used to be Granada’s Grand Bazaar. Here, on a site that originally stretched all the way to Plaza Nueva, the finest herbs and spices from north Africa were sold alongside Arabic silks, fabrics and ceramics. The Grand Bazaar burnt down in the 19th century – owing to a fire in a matchstick factory, of all things – and although the modern-day Alcaiceria is a fraction of the size of its sprawling predecessor, it’s still one of the best places for souvenir shopping in the city. Available here is a colourful array of Moorish fabrics, lanterns, handbags and knick-knacks to rival Calderia Nueva, as well as a superb selection of spices, spice blends, herbs and herbal tea mixes. Simply browsing in the Alcaiceria’s clustered little alleyways is a pleasure in itself, and allows you to imagine how wonderfully chaotic the original Bazaar must have been. If you’re heading up to Albaicín to explore Granada’s oldest neighbourhood, stop off at Reez, a little shop on a charming cobbled square about halfway up the Cuesta del Chapiz hill. Reez’s speciality is handmade glassware: vases, bottles, bowls and glasses that make classy (if rather fragile) gifts to take back home. Also available in its tiny space are jewellery and colourful ceramics that are also all locally-made by the artisans of Albaicín, Granada’s former Arabic quarter. You can also visit the shop’s studio and workshop and see Reez’s owners, Juan and Celia, crafting the exquisite glass products on sale in the shop.